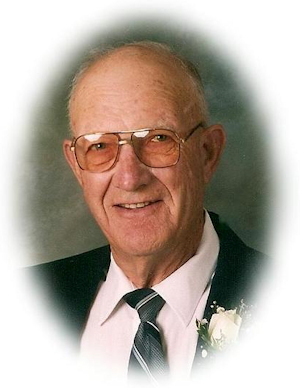 Obituary – Berry, John Marvin « Perry High School Alumni Association, Inc.
John M. Berry, 86, of Perry, Oklahoma, was the son of Henry H. and Mary Johnson Berry. He was born December 27, 1921 east of Perry, Oklahoma in the house in which he lived all of his life and died Monday, August 25, 2008 at Perry Memorial Hospital. John was a 1940 graduate of Perry High School. He was a member of FFA and received the Junior Master Farmer Degree in 1940. He and Dorothy Edwards were married on September 2, 1945 in Perry, Oklahoma. A lifelong resident of the Perry community, John was a farmer-rancher and had been a carpenter, employed at Long Bell Lumber Company and the A.C. Houston Lumber Company, later owned by Harold Sorrell. John worked at Charles Machine Works for 17 years before retiring on December 30, 1989. He was a member of the First Christian Church where he had served as Sunday School Superintendent, a deacon and an elder. John enjoyed football and basketball, especially the OU teams. Funeral services will be at 2:00 p.m. Thursday, August 28, 2008 at the First Christian Church in Perry. Rev. Martin Foster will officiate. Interment will be in Grace Hill Cemetery. Services are under the direction of Brown-Dugger Funeral Home. The family will receive friends from 6:00-8:00 p.m. Wednesday, August 27, 2008 at Brown-Dugger Funeral Home. Memorials may be made to the American Heart Association, the Alzheimer’s Association or the First Christian Church in care of Brown-Dugger Funeral Home, 1010 N. 7th Street, Perry, Oklahoma 73077. John is survived by his wife, Dorothy; one daughter, Lana Moore and her husband, Gary of Perry, Oklahoma; one granddaughter, Pam Lamirand, of Perry, Oklahoma; one grandson, Kevin Moore and his wife, Becky of Stillwater, Oklahoma; two great-grandchildren, Trevin Lamirand, of Perry, Oklahoma; and Rylee Moore, of Stillwater, Oklahoma; two brothers-in-law, Donald Edwards and his wife, Dorris, and David Edwards and his wife, Janice, all of Perry, Oklahoma; one sister-in-law, Ada Edwards, of Houston, Texas; and many nieces and nephews. He was preceded in death by his father, Henry H. Berry; mother, Mary Berry Leistikow; step-father, Otto Leistikow; and brothers-in-law, Steve Edwards, Robert Edwards and Thomas Edwards and his wife, Irene.